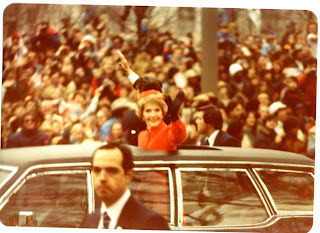 As we await tomorrow's historic event I thought I would share some pictures from the Reagan inauguration in 1981. I often think about how children never seem to care about temperatures. They'll swim in ice water without a care. And yet, having grown up in Saudi Arabia, I know I had to have been cold. After all, standing outside all day in Washington on the 20th of January is not exactly balmy. I look at the weather report for tomorrow's events and I think how cold it must be and also that students from my school are probably going to have to endure it. I don't see snow on the ground but do remember a light layer of snow and frost when I was there. I went to The Madeira School starting in my sophomore year. It was 1980 and Reagan was elected in November. My school is in Virginia and many politician's and dignitaries' daughters went there. Our junior year we were required to work on Capitol Hill, so we had many connections. We were bussed to the Mall and got relatively close to the Capitol. Close enough to see them as small figures on the stage and within a protected area. 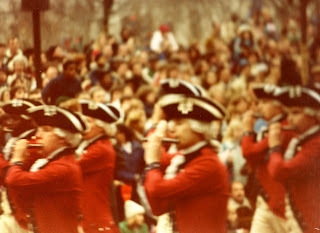 I really don't remember much about the swearing in except for having to make the long walk afterward across the Mall to Pennsylvania Ave. to find our bleacher seats for the parade. We were lucky to have bleacher seats and thus great views of the parade. The one thing I remember the most is Bush's car. We didn't really like Reagan that much and preferred Bush for some reason. 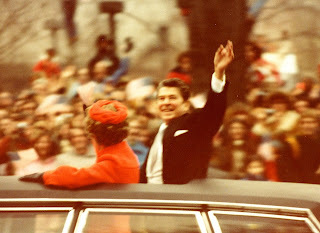 So when Bush's car came by we screamed twice as loud as we did for Reagan's. 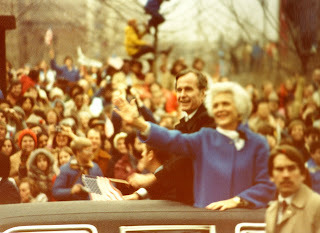 We were so loud that Bush heard us, turned our way and waved in recognition of our support, even jumping up and down a bit to cheer back at us. I know that there are millions of people who will be tuned in tomorrow. Too bad it's a work day. I'll be watching via the internet. I'm glad I got to go to an inauguration and can understand how much bigger this one is, but I'm happy to watch from afar, not battle the crowds, have a bathroom close by, and be warm!